My thanks go out to Derrick Belanger of Belanger Books for my copy of this book. The stories in this volume all take place during the three years when everyone thought that Sherlock Holmes had died at Reichenbach Falls. Some of them are tales of adventures that Holmes mentioned, such as his trip to Tibet and his pilgrimage to Mecca. Some deal with people Holmes encountered some who needed help and some who provide help. Above all, Holmes may use a disguise, he may change his identity, but Holmes cannot be anyone else but Holmes! He is an observer and deduces from observation, and that part of him he finds impossible to suppress. All of the stories in the book are good and I cannot really say which one I liked the least. But the one I will give BEST IN BOOK is “Murder on Mount Athos” by Katie Magnusson. This story holds the very best twist of any other in the volume. It is so good that I will say no more except please do read it! You are going to love it! The book opens with Arthur Conan Doyle’s “The Final Problem” which is the story where Doyle resurrects Holmes. In “The Secret Adventure of Sherlock Holmes” by Diane Gilbert Madsen, Holmes tells Watson of an adventure he took for the Royal Family during the Great Hiatus. “The Harrowing Intermission” by Craig Janacek deals with Dr. Watson joining Lestrade while Holmes is away to investigate a murder. “The Adventure of the Indian Protégée” by Jayantika Ganguly is a very close second to “Best in Book!” The less I say about the case, the better. A must read! “The Adventure of the Dragonman’s Son” by Jon Linwood Grant reminds the reader that things are not often what they seem when Holmes is involved. The final story, “The President’s Roses” takes Holmes to the states and a case for President Benjamin Harrison. And there the tales end, but fear not, this is only volume one! 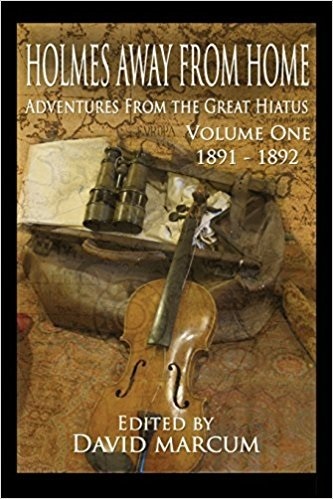 David Magnum continues the adventures in volume two of “Holmes away from Home!” I give the volume five stars plus!